Do You Offer Professional Development? Yes. 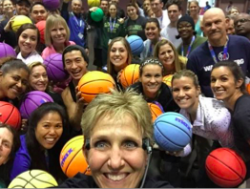 Our talented team of Skillastics Educational Specialists will actively engage all participants through a half or full-day training customized to fit your needs. Sandy Slade is also available to conduct professional development on a limited basis. Click Here to learn more about our variety of training offerings. Call us at (888) 842-7746 or email us here to receive pricing. Skillastics is a proud partner and recommended resource of SPARK®, whose dedicated trainers are also available to provide Skillastics training. Contact SPARK directly for more information.